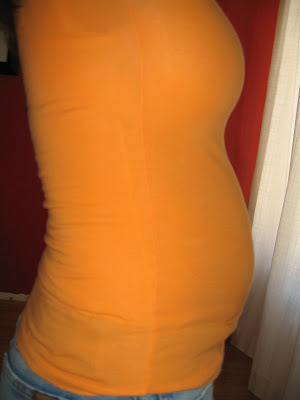 This is a photo of my belly at seventeen weeks preggers. That’s Enzo in there. When this photo was taken I strongly suspected that the resident of my bump was a baby boy named Milo. I was right about the baby boy part, wrong about the Milo part. Tonight, after gorging on warm biscuits and pear butter my non pregnant belly was quite possibly larger than the belly you see above. I probably should have taken photos to compare…but I didn’t. The joy that’s found in a belly distended with good food cannot be captured by photographing the belly in question. It’s true. I could tell you how the pear butter was sweet and rich, smooth and cold, the perfect accompaniment to the flaky warmth and the slight bite of salt in the biscuits. I could tell you how I savored every bite and reveled in the yumminess I had created. That might convey the joy. A photo though, would not. For that reason, I’ll stick with the photo of the baby belly, because photos of baby bellys do convey joy. When I look at that photo I remember the little jabs I felt against the waist band of my pants when I sat down. Some of the first movement I detected from that boy was in protest to the waistband of those jeans. I also remember how ecstatic I was to still be wearing the jeans. I remember how good it felt to not puke, and not feel like I was going to. The non-puking is a blessing that week sixteen brings along, allowing week seventeen to fully enjoy the rapture that is consistently keeping one’s food down. When I look at that photo I remember sitting in this very spot, grumpy and thinking about the lack of connection I felt with that baby, even as I felt him(her?) punching the waistband of my pants. Nearly half way through the ordeal of bringing him(her?) into the world I just didn’t feel a connection. Mid way through the pity party I was throwing myself a light clicked on. Don’t feel a connection? What was this garbage I’d been telling myself? That baby was a Boy, from that minute on I knew he was, and his name was Milo (or so I thought). That is one of my happiest minutes of life and it’s what I think about when I look at that picture. A photo of tonight’s belly, if I were to run across it in three and a half years time would not usher forth cherished memories. It would just make me wonder what on earth I was thinking allowing my overstuffed gut to be photographed and vow to do a little more ab work. But those bicuits sure were tasty. Mmm, I love biscuits like you wouldn't believe. I wish I had been there for the joy.